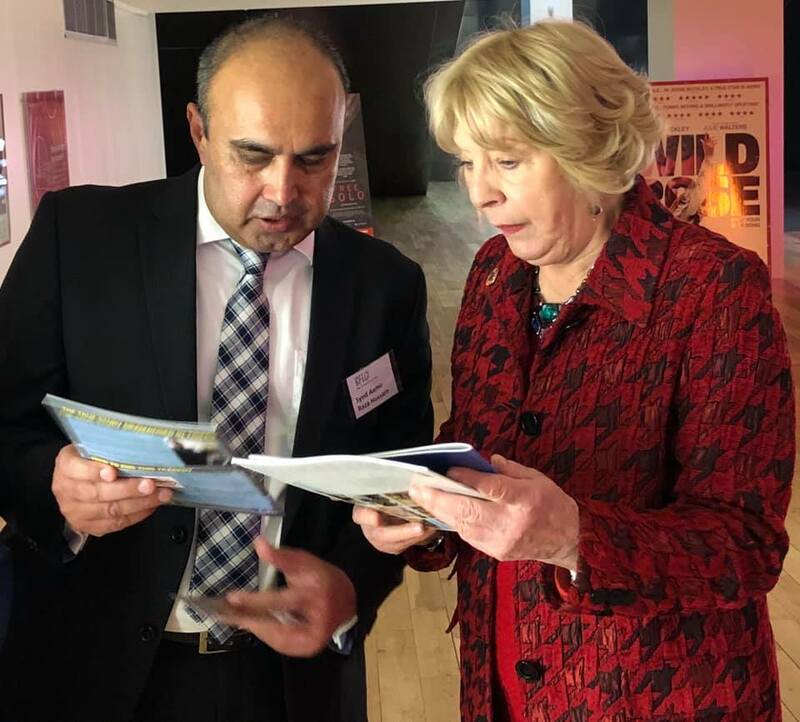 Aamir shows Mrs Sabina Higgins, Ireland’s First Lady, the evidence of malpractice that caused him to resign from Nestlé. Last night’s screening of the #TigersMovie & the panel discussion that followed was quite simply incredible. This is a movie more people need to see. Unethical practices in the area of babymilk promotion is something that we all need to be aware of. @sraamir15 you’re a hero! Screening of the movie Tigers in the Light House cinema hosted by BFLGI (Baby Feeding Law Group Ireland). President Michael D. Higgins and his wife Sabina, Syed Aamir Raza (the main protagonist of the movie), Patti Rundall, Baby Milk Action UK (one of the characters portrayed), Professor Donal O’Shea, the HSE Clinical Lead for Obesity — Dr Cathal McCrory, Research Assistant Professor, TCD, Professor Roy Philip, Consultant Neonatologist, University Maternity Hospital, Limerick, and Laura McHugh, National Breastfeeding Coordinator, HSE. Also present, Mr Shahzad Dastgir Nousherwani, from the Pakistan Embassy. Tigers is based on the true story of a former Nestlé baby milk salesman in Pakistan called Syed Aamir Raza (played in the film by major Bollywood star Emraan Hashmi) who took on the industry with the help of Baby Milk Action and IBFAN (the International Baby Food Action Network) when he realised that babies were dying as a result of his work pressuring doctors to promote formula. Ireland’s President Michael D. Higgins, was sadly unable to come at the last minute, as his dear friend Sally O’Neill, of Trocaire, died in a car crash that day. 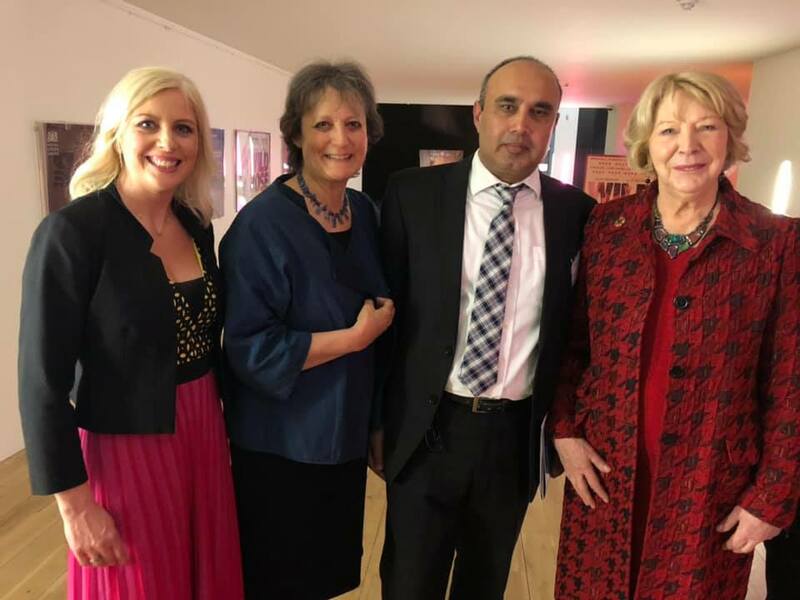 We were honored that Ireland’s First Lady, Sabina Higgins, (far right above) was able to attend for the whole evening and promised to do all should could to help. (From the left: Aoife Hearne Patti Rundall and Syed Aamir Raza). The marvellous Baby Feeding Law Group Ireland Team – including Malvina Walsh, Elizabeth O’Sullivan, Aoife Hearne and Claire Allcott. Mr Shahzad Dastgir Nousherwani, Deputy Head of Mission from the Pakistan Embassy. A central theme of Tigers is the inappropriate sponsorship of the health care professionals and how this can influence the advice and support parents receive. The Baby Feeding Law Group (BFLG) was set up in the UK in 1997 following the adoption of the first of 8 World Health Assembly Resolutions to call for Conflicts of Interest safeguards in child health (1). BFLG Ireland was formed in 2017. Since 1997 over 20 leading health professional and civil society organisations have worked together in an effort to bring UK and EU legislation on the marketing and safety of formulas and baby foods into line with WHA requirements (2). Over the years legislation has been strengthened – although it still fails to meet the minimum needed, especially in relation to look-alike formulas for older babies. These products are nutritionally inferior and often high in sugar, but are aggressively and misleadingly marketed – fuelling the obesity epidemic. Most BFLG members, such as the Royal College of Midwives and the Community Practitioners and Health Visitors’ Association, now have strong Conflict of Interest policies. In the last few months the British Medical Journal (3) and the Royal College of Paediatrics have decided to stop taking formula company adverts and funding . C4’s Despatches – The Great Formula Milk Scandal also tackled this subject. (4) EU Legislation and Global trade Although, as mentioned above, EU legislation on baby food marketing fails to meet WHO marketing requirements, in terms of food safety, its Precautionary Principle and the EU charter of Fundamental Rights are stronger than many. This is important especially when it comes to trade, where food and agri-business interests dominate. World Trade Organisation (WTO) rules in comparison are essentially the lowest common denominator for trade in the 21st Century. At Codex meetings where global trading standards are set, it is often a fight to ensure that standards protect human health. Baby Milk Action – IBFAN UK has attended Codex nutrition meetings every year since 1995 in order to strengthen Codex standards and bring them into line with WHO recommendations. Baby foods and the new threat of Anti-Microbial Resistance (AMR) are current hot topics on the Codex agenda. The EU phased out the routine use of antibiotic growth promoters between 1997 & 2006. If the UK leaves the EU – it is not clear if it would support the adoption of strict Codex standards or follow the US and others who fail to put human health first. Without effective action at national and global level, common infections and minor injuries – the kinds of things we have been able to treat for decades – will emerge as killers once more.